At the start of the 20th century, an enterprising Swedish immigrant named Peter Manson looked at the bustle of harbor traffic in and around Seattle and saw an opportunity. He put together a floating pile driver and by 1905 he was engaged full-time in the pile driving and waterfront construction scene around Puget Sound. Through good times and bad, Manson Construction formed an enviable reputation for good, honest, hard work which was completed in a timely manner. Early jobs included numerous docks that served Puget Sound’s Mosquito Fleet of ferry boats, along with fish traps and bulkheads. Work then grew into providing ferry landings, small bridges, and foundations. In time it became evident that larger equipment was necessary for new technology steel and concrete structures. Part of Peter Manson’s innovation and imagination included expanding the size and number of his floating equipment fleet. 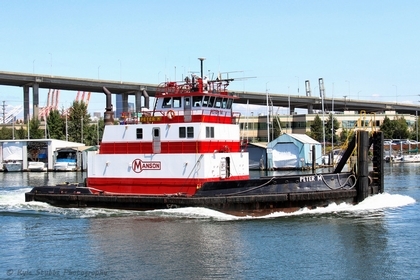 At the same time, the company reached out from Puget Sound to use its fleet cost effectively. It found work in Alaska, Oregon, California, and a number of other places worldwide. Today, branch offices in California, Louisiana, and Florida manage much of the work that keeps Manson active on all three coasts and at the forefront of the marine construction and dredging industry. The original pile driver grew into five scow pile drivers, and today the Manson fleet has grown into 20 floating derricks, 4 cutter suction dredges, 4 hopper dredges, dozens of barges, 31 tug and assist boats and miscellaneous equipment of pile hammers, clamshell buckets, and land equipment such as truck cranes, crawler cranes, dozers, and loaders.